It was supposed to be one of the music business’s stories of the year: French Spotify rival Deezer floating onto the Paris stock exchange by the end of October. But now, just three days ahead of its deadline to do so and raise €300m-€400m ($330m – $414m) Deezer has pulled out. The company says it’s postponing its IPO due to tough “market conditions”. Some will quibble with that statement. When Deezer announced plans to IPO last month, it released an in-depth document which revealed everything – good and bad – about its company’s fiscal health. Some elements of the report were quite alarming. This is one of the least-reported yet most shocking music streaming statistics of 2015: in a world where streaming companies typically struggle to post a profit but have soaring user numbers, Deezer has lost subscribers this year. As you can see below, Deezer’s total global subscriber base has fallen by more than 500,000 year-on-year as of June 30. Get this for double-speak: Deezer categorises its subscribers into ‘revenue-generating’ and ‘non-revenue generating’. When you crunch the numbers, only 3.8m of its subscribers are actually coughing up month-to-month, either through a standalone subscription or a bundle deal. The reason for this revenue-generating/non-revenue-generating madness is all to do with what Deezer calls its ‘monthly inactive bundle subscribers’ – usually, people who got a free trial Deezer subscription with the purchase of a device. ‘Inactive’ subscribers are qualified by not having played a single stream in the past 30 days. Some of these are ‘revenue-generating’ – largely through structured payments from telco partners – and some are not. As we stand in 2015, there are 3.34m ‘monthly inactive bundle subscribers’ using (or rather, not using) Deezer. That amounts to 53% of the service’s total 6.34m subscriber base. Okay, you kind of expect this from a streaming company these days. 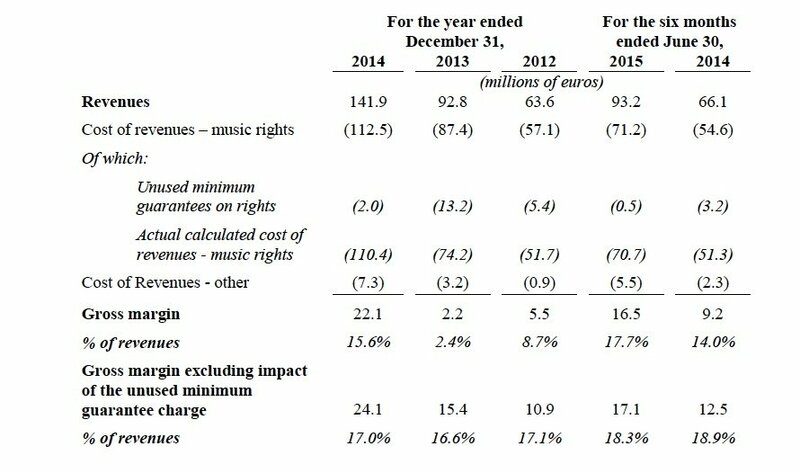 But from 2012 to the end of the first half of 2015, Deezer posted €87m ($99.5m) in net losses. There’s no getting around it – that’s a possible red flag to any potential investor. 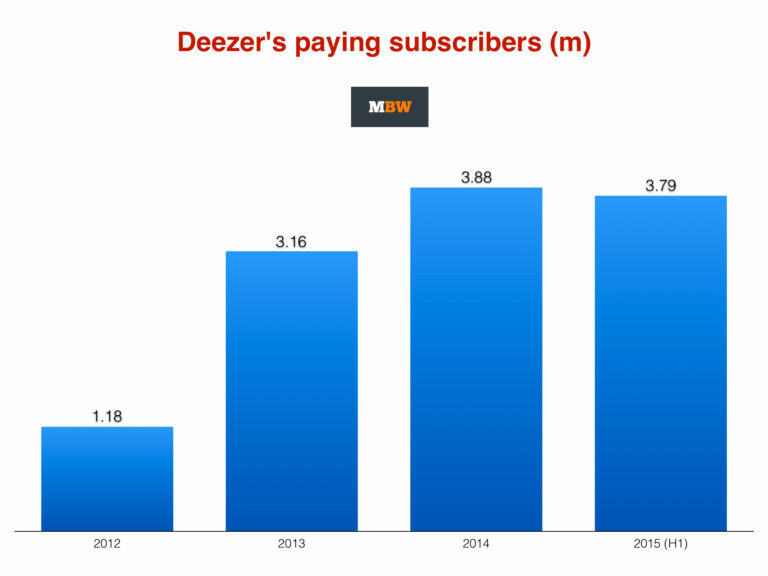 There are a couple of bright spots in the numbers above for Deezer, however. Firstly, its revenue is up year-on-year. In the first half of 2015, it posted €93m, an increase of 40% on the same period in 2014. Plus, its total losses have reduced, down from €12.82m in H1 2014 to €8.96min H1 2015. But let’s face it: that means it’s still losing around €1.5m every month, while its subscribers reduce. And of those subscribers, remember, almost half aren’t paying, and over half aren’t using the service. What a pickle. Deezer scored a coup in its early days by signing a long-term bundle deal with Orange in its native France. It’s largely why the company remains the streaming market leader in the territory, despite Spotify’s rapid growth around the world. But this relationship now looks a little precarious. 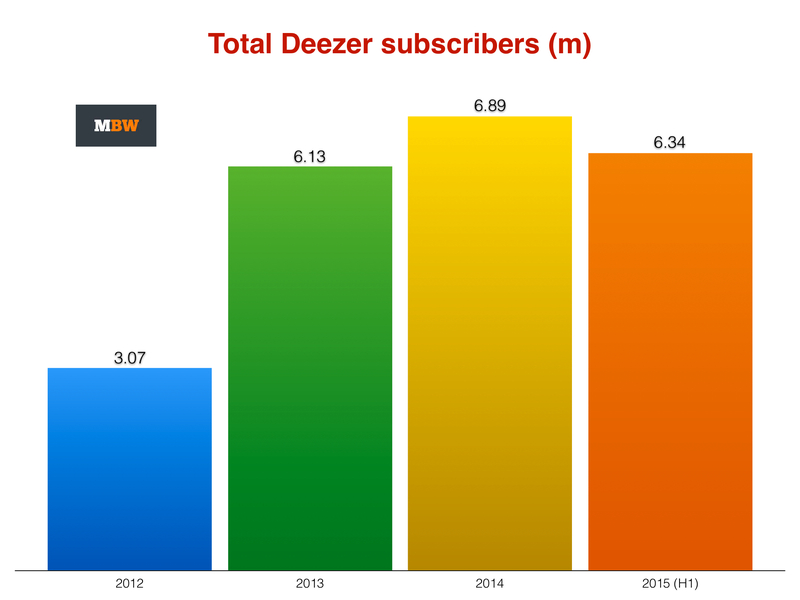 First, the good news: Deezer’s business isn’t half as reliant on Orange as it once was. In terms of global revenue, the Orange partnership delivered 56% of Deezer’s income in 2012. In 2013, this fell to 38% and it was down to 28% in 2014. In the first half of 2015, it contributed just 24%. Now the bad news: since the end of 2014, Orange France has ceased acquiring new bundle subscribers for Deezer. This explains a lot about (1) above. It gets worse. Since August last year, Orange has been paying Deezer a ‘substantially reduced minimum guarantee’, and is not obligated to pay the platform any advances after July 2016. And here’s the fact that will have Spotify salivating: Deezer’s exclusive lock-in with Orange also expires in July next year – when another partner could swoop. Plus, Deezer’s overall Orange partnership agreement will expire in July 2018, at which point Deezer could lose all of its Orange customers. We’ve already covered this one extensively through here. But, in summary, between 2012-2014, Deezer paid out $23m in unallocated advances to record labels. The concept of this so-called ‘breakage’ isn’t always an easy one to explain. So let’s have a bash at illustrating, as simply as possible, why it’s such a pain for Deezer. Imagine this: rather than paying your electricity provider monthly/quarterly, you agree to give them a lump sum for the year ahead, based on estimations. At the end of that year, you realise you have given them far too much vs. the amount of electricity you’ve used… and then the electricity company keeps the difference.